Step by step guide showing how I went from Page #9 ranked #376 to Page #1 ranked #39! 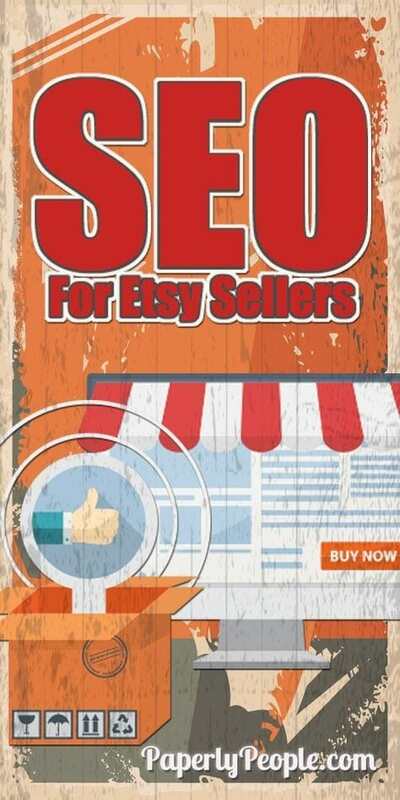 Learn now to to succeed at Etsy SEO the simple way today! While it can seem like ranking high for a specific keyword is magic, there is actually a system you can use to help determine the best keywords that you should target to show up in Etsy searches. This is based on sound SEO practices that I have used to rank well in Google for over 15 years! The cool thing is that it is not a “trick” to fool Etsy, but is just using data to see which keywords are most advantageous for you use to choose! The first thing that you have to know is that Etsy is a database. A computer program based on data. And the way that they they can tell what is in that database is the words that we use to fill out our listing forms! Update… there is no official word from Etsy that the description matters but some of us have seen keywords in our stats that are not in our titles or our tags. There is an old saying in the tech world, “garbage in, garbage out”, which means that your data is only as good as the information you put into it. After all the hard work you put into your product, it can seem like just another chore to have to load your listing, BUT this is the part that can make or break your sales! Half Science, Half Knowing What The Heck You Are Doing! If you want to be good at Etsy SEO, you have to practice. The first couple of times you do it will seem like running through mud, but after a while it will start to come naturally and you will just have to do a quick search to see what words you should use! You probably have an idea of what you made and what it is called, so start with a basic idea! For example lets use one my favorite things to search for on Etsy for this first example… dog beds! 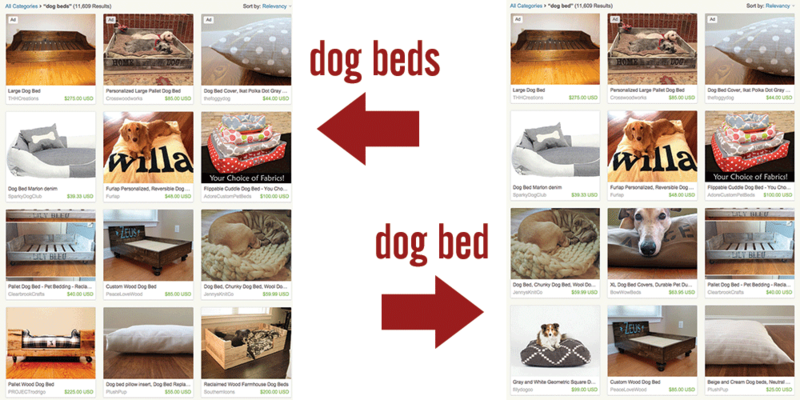 Step Two… do a search for your keyword, in this case we are using “dog beds” (without the quotation marks). 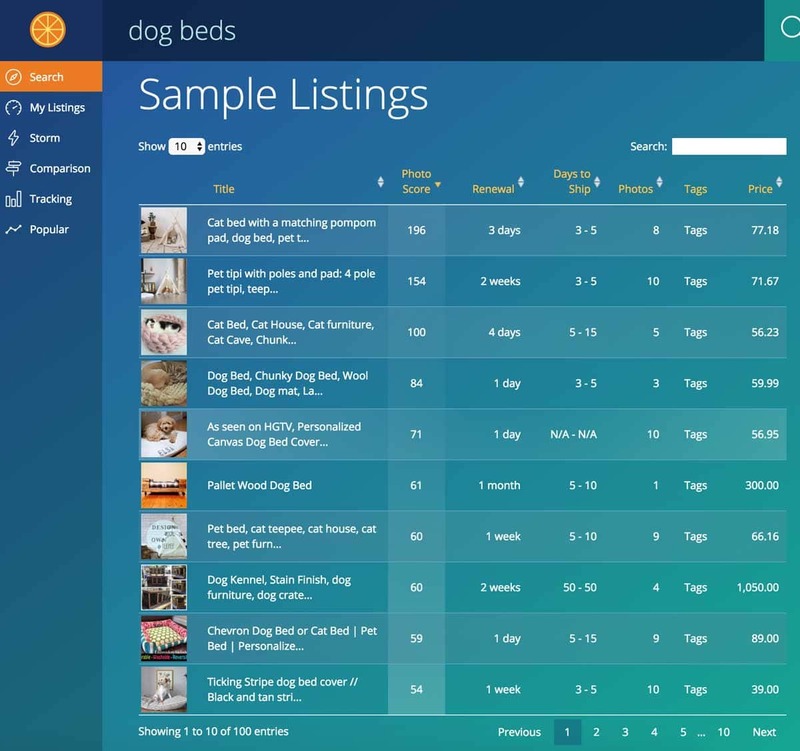 As you do this more you will learn some things about how people search for products…for example I chose “dog beds” instead of “dog bed” to target for my research. Now, Etsy returns the same number of listings for each of those terms so they know that they refer to the same thing, BUT there is a difference in the order that they show the listings. As you can see, the first six are the same, but the next ones are all mashed up! Three are the same, just in different order and three are brand new. The reason to choose the plural is that is how humans search. 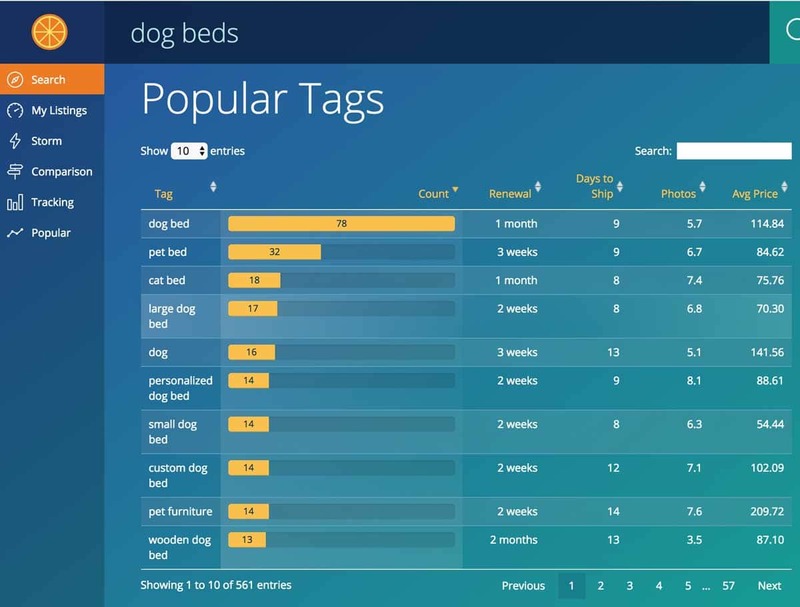 Going back to the Google Adwords planner to test this, here are the search volumes for each of the two words..
As you can see, there are over twice as many searches for dog beds as dog bed! I would much rather spend my time doing research where there is twice as much traffic. Note: I would probably use dog bed in my listing description and make sure that I had it in my tags! Do the research for computers and the work for people! Okay, what does this tell us? Etsy Searches. 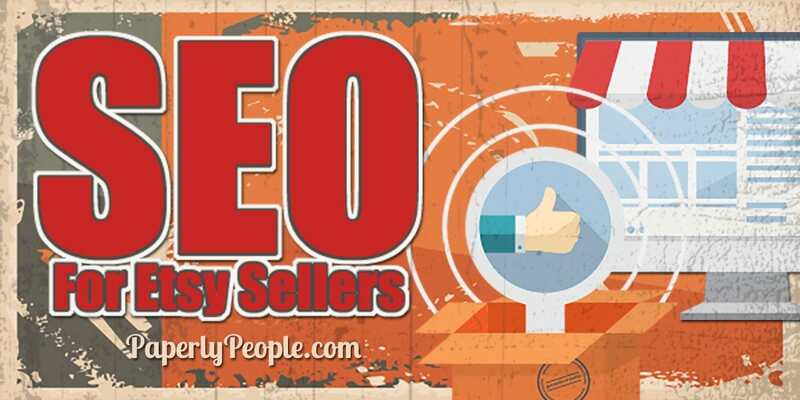 There are between 600-800 searches for that exact keyword phrase on Etsy per month. As you can see from the green color, that means that this is a pretty high volume keyword to target. Etsy Engagement. On those searches there are between 1K-2K clicks on the items. That is about average as generally searchers will click on 1.7 products before heading back to try a new search. Competition. It shows that there are 17K competing products. Dang that is a lot of competition! In this case I would do the research for dog beds so I knew my baseline and then also do research for “cute dog beds” or “big dog beds”. Shops Competing. Hmm that is not too bad, only 64 shops competing. 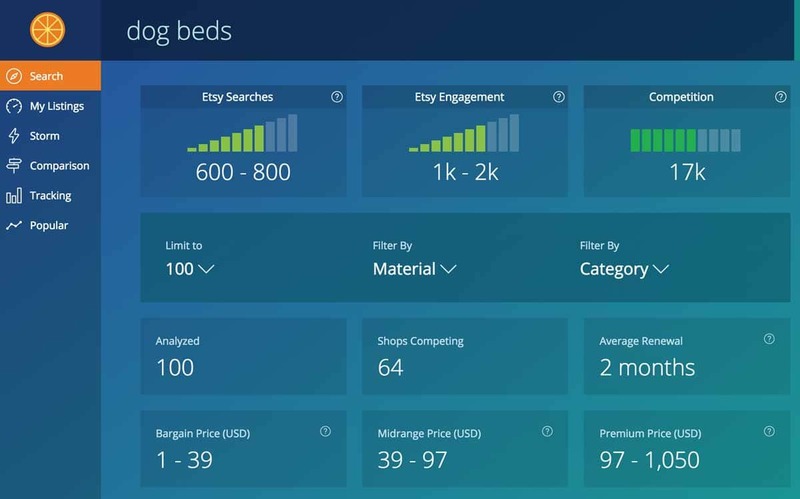 That said, there are only 19 shops competing for “big dog beds” (with the quotations marks to show ONLY the ones that say big dog beds in that word order). Average Renewal. One of the metrics that Etsy uses in their search algorithm is recency of renewal. Since most of the shops in this keyword are only updating their listings every two months, you could increase you rankings by having a monthly or even bi-weekly renewal strategy. Bargain, Midrange and Premium Price. If you have a quality product and good customer service then you can charge mid range prices. To charge higher prices you need to be sourcing or making high quality products. NOTE! Good SEO can fix your visibility problem, it cannot make people buy if you don’t have good sales verbiage or pictures in your listing! YAY! Now you know what is happening overall in Etsy. This is great data to have, but now we are going to dig deep and see what our competition is doing! This one is super cool and gets all your potential keywords into one place! Write down the top 10 tags used as an average. Now, some of those may not apply to your product, but it is good to have them there to when you are trying to do your own listing categories. Now we are down to the exact items that you are competing against to get better rankings. This is where you can find some great data to see what they are doing and then start to pick out some other keywords and tags you can use in your listing. It doesn’t pay to rank well for something that is really not like the others. It will just frustrate shoppers and decrease your views to favorites numbers. Listing Title. On the chart in Marmalead they show you the shortened version of the title that shows up in mobile searches. But you want to click through to see the entire title so you can start to pick out keywords you might want to use in your listing. 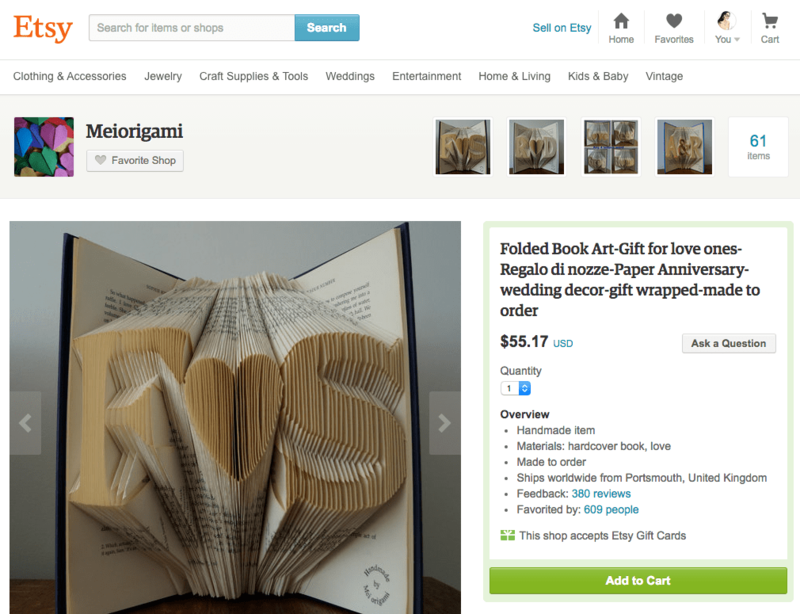 The title for this #1 listing is Folded Book Art-Gift for love ones-Regalo di nozze-Paper Anniversary-wedding decor-gift wrapped-made to order (Regalo di nozze is Wedding Gift in Italian). Well they have A LOT gift phrases in their listing so I would definitely make note of that. Feedback. Now note the number of feedbacks the shop has. If all of the listings in Etsy for this word have thousands and you have only a handful, it will be hard to compete early on. Favorited by. You can also see how many favorites the shop has. Note this. Now click through to the shop itself! Number of sales. Check and see how many sales they have had. Number of admirers. Also the number of admirers. Photo Score. This is how well your competition’s primary photo is doing at attracting clicks. It is worth taking a peek to see what they are doing right! Renewal. We can see the renewal period for each of the listings. Only one on the list is a month or more. I would think that if we did bi-weekly we could stay super competitive. Days to Ship. This is an interesting stat. As we can see the sellers in this category are all over the place. I would think that the 3-5 days are premade and the 50-50 are for custom products. I feel that you should have a realistic time frame based on your business and life. If you sell a quality product people will wait. Photos. We have 10 photos available and I think we should use them all if possible. That said, I don’t have that many on my digital listings and would like to see how many competition shops are using so I can be competitive at least. Tags. Good to use for generating a large list of possible keywords. Hover over the tags word. Price. Intersting to see why the competition might have higher or lower prices! Okay, all along I have been saying to write this down or note that, but how do you get it into some kind of format that will let you actually do something worthwhile? I made myself a handy dandy worksheet to use for this and thought, why not make it available to all my Etsy peeps! 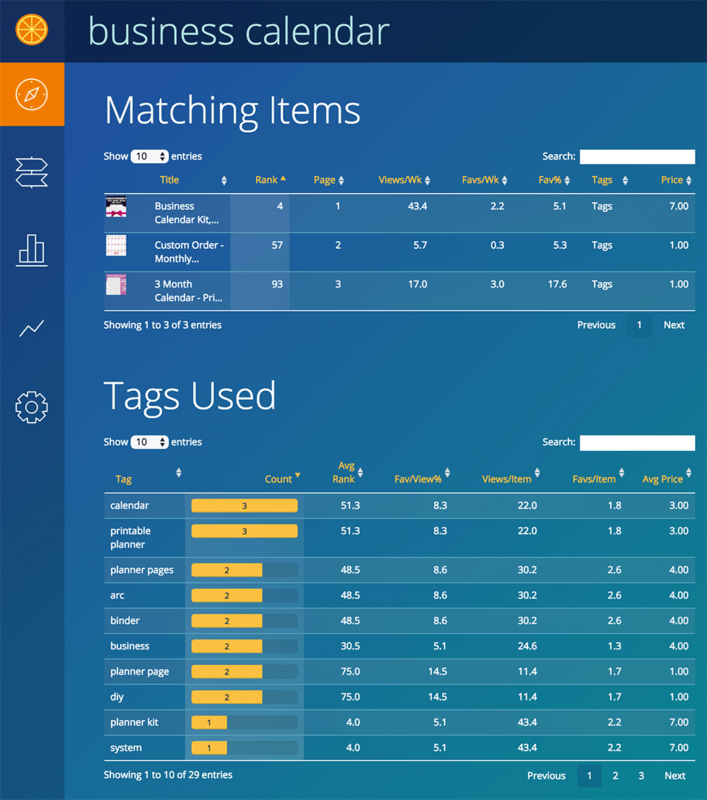 This worksheet is perfect for tracking all of the data that you are collecting on your competitive keywords in one place. 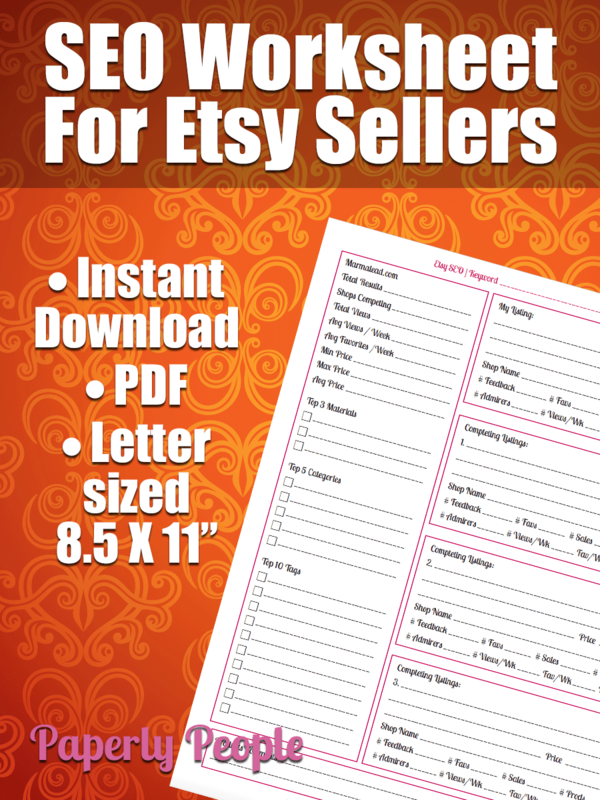 >>> Get the Etsy SEO worksheet now! PS… I asked the boys over at Marmalead if it was okay and they said YES! So as I was trying to get a handle on my SEO for Etsy, I really couldn’t find a great way to get all the data together easily. I was thinking that I would have to start making spreadsheets and charts to see everything all together. And then I found the Marmalead and I was THRILLED! For free they had most of the data that I wanted all in one place! Now, I do pay the extra little bit for the upgrade because then I can see my listings and data, but if you are just getting started the Dabbler for free will do you just fine! >> Sign up for Marmalead now! Affiliate disclosure. 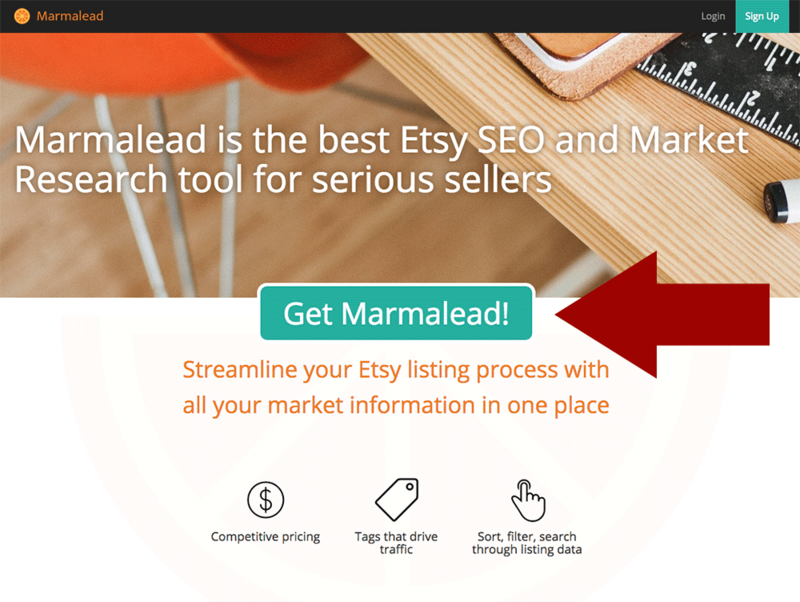 I do receive a compensation if you purchase Marmalead, the best Etsy SEO EVER, through my link but you will never pay more for using it and I would super appreciate it if you could sign up through me! It is because of representing great products like this that I can keep doing review and tutorial posts! NOTE: The info in this section is using a previous version of Marmalead, but the strategy is super sound still! Okay, I promised you a case study and here it is! I am a super new Etsy user but an old dog SEO person. I started doing SEO in 1999 and so I have seen all the changes and updates that Google has gone through and frankly, true SEO hasn’t changed that much over the years. Functionally what you have to do is have a great product, then find the keywords that people are using to search for that product and then include them in what you are presenting. Etsy SEO isn’t really all that different from Google, just there are Tags instead of keywords. 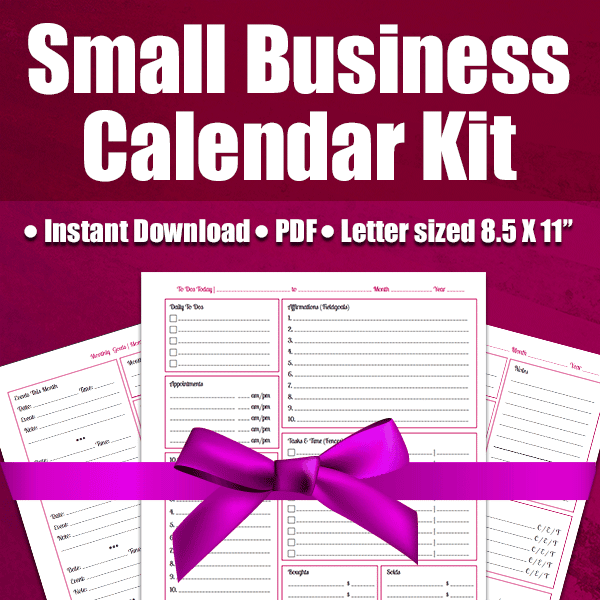 So I have a product called the Business Calendar Kit. It has a cute little graphic and is actually really a functional calendar system, but I wasn’t really showing up in Etsy search the way that I wanted to. Here is what I had in my original listing. Dang…I really needed to make some changes so I redid my listing using the same process I discussed above and went from #4 to #1 overnight! Whoo whoo! Page #9, #396 in Etsy, Views/Wk 43.6, Favs/Wk 2.2, Fav% 5.0. BUT my product didn’t really match. All the other business planners seemed to have lots of pages and be really comprehensive and mine, while awesome is not really that. So I thought, I will put it once in my title and once in my tags, but make sure they really knew it was a calendar are not a planner! As you can see I also changed my category and some other tags and waited for the next morning. 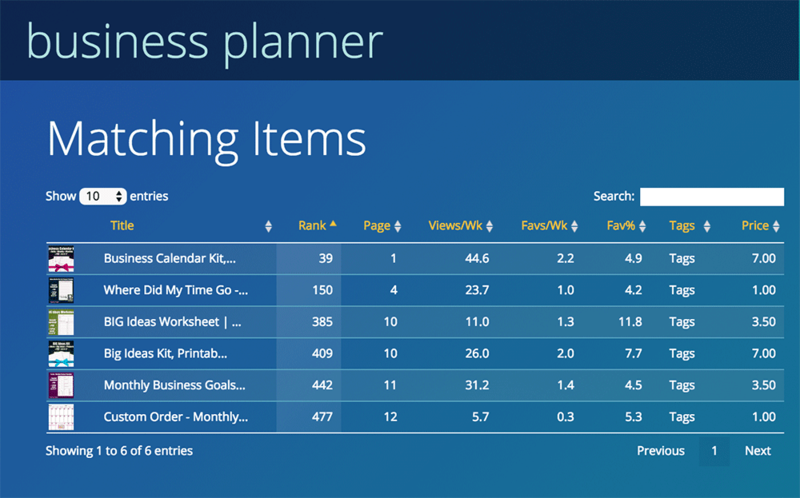 I ALMOST didn’t even check business planner because I thought it was dud for me! Holy cow! 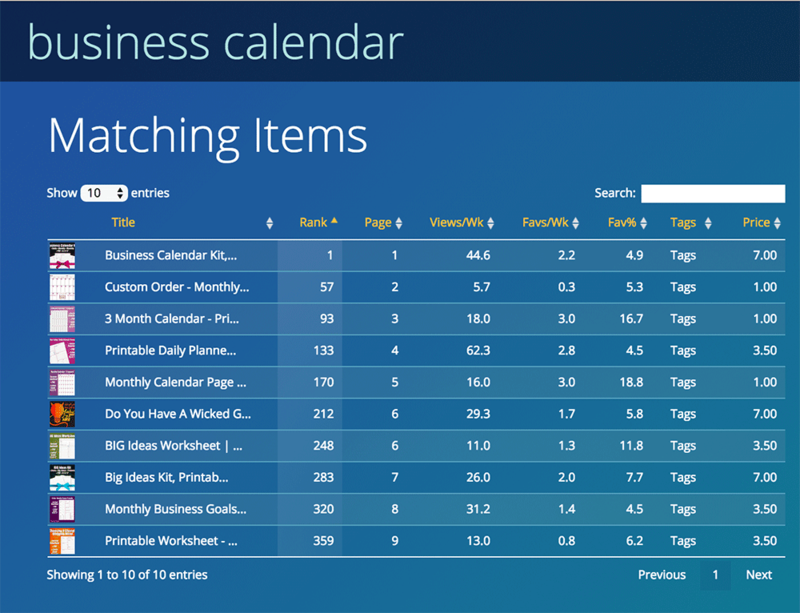 The next morning (a Sunday) when I got up I had made page one for Business Planner…are you freaking kidding me? SO COOL! Okay, I admit, I am an SEO nerd, but had I not had the ease of using Marmalead for the bulk of this project I would never have done the work. 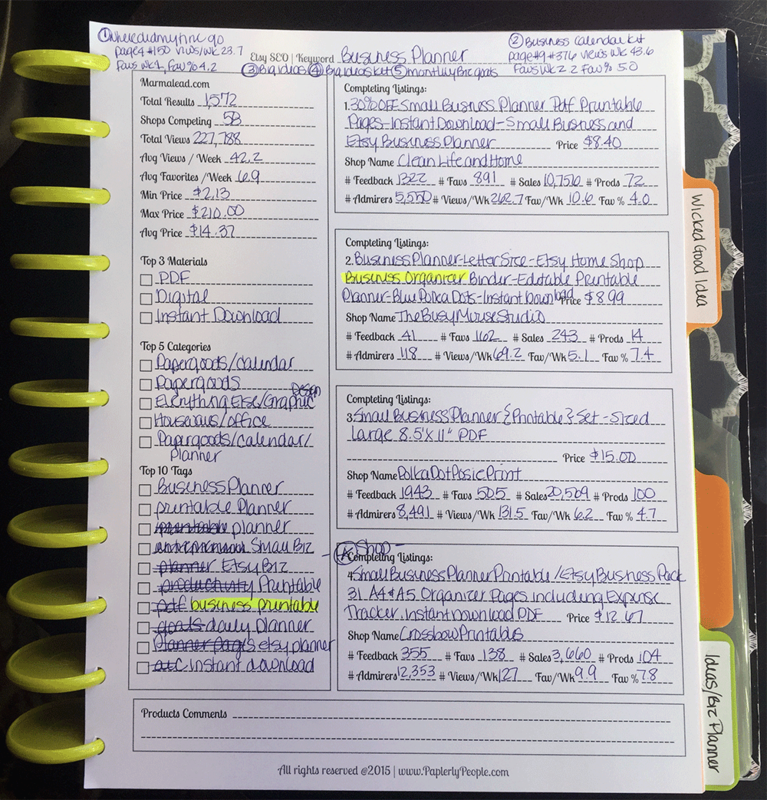 If you are all the way down here, I thought you might be a little nerdy too and want to see my worksheet that I used to do the Business Planner research.